Red Snapper, Grouper, Amberjack, Mackerel and Cobia Time in Orange Beach. If you really want to have some fun during the 2015 fishing season, you need to start making your deep sea fishing plans today. No matter what is in season or available to harvest, we promise to take you to the best spots and give you a chance to catch some really amazing fish. You may not be able to keep them, but we will take some beautiful pictures of your catch so you can prove that you caught them. We fish for the enjoyment of wetting a hook and just being with family for a day on the water. For those of you who want to keep a few fish for dinner, I am going to take the next few paragraphs and explain to you what is in season 2015 . This year is the first year in history that the federally permitted charter boats like ourselves are expected to see some relief from the short seasons we have seen since 2007’s re authorization of the Magnuson Stevens Fishery Conservation Act (MSA). The MSA is responsible for helping rebuild our over fished waters in the Gulf of Mexico to a point to where we are about to start reaping the rewards of being responsible for so many years. Even though most of our favorite local fish are closed to harvest during peak tourism seasons, we still can go catch and release any fish you like. If you catch a species that is in season, you are always welcome to keep them for dinner if you like. Depending on the time of year you are coming to Orange Beach or Gulf Shores, there are many fish species you can keep if you book a long enough trip or come during certain times of the year. The most common fish we catch are: red snapper, vermilion snapper, lane snapper, mangrove snapper, gag grouper, red grouper, scamp grouper, warsaw grouper, greater amberjack, lesser amberjack, banded rudderfish, cobia, spanish mackerel, king mackerel, bonita, jack crevalle, red drum, jolthead porgy and red porgy. Red snapper season for federally permitted charter boats is supposed to be about 30 to 34 days in length this year, beginning June 1. The bag limit is supposed to be 2 per person. Hold on, this is a projected number that is subject to be reduced until we see what the non-compliant states do with their season. We will have to wait and see what the state water seasons are going to be before we get a final number. We are projected to have a longer season because we now have a separate allocation of fish (x number of pounds) to harvest than the private boat owners. Since we are all recreational anglers, we charter boats are still tied to the hip with private boat owners who fish in state waters from Texas to Florida. There is a chance that the entire quota of red snapper can be harvested by private boat owners fishing in state waters of Texas, Florida and Louisiana before we even get to the projected June 1 opening. The red snapper landed by private boat owners fishing in state waters comes off the entire quota and has to be subtracted from the total amount. If this happens, the 30 to 34 day projected season could be cut short to adjust for the amount that will be harvested in state waters. So if you are booking a fishing charter for the sole purpose of harvesting red snapper, you better plan it during the first couple of weeks of June. There is still no guarantee if they will be in season when you get here. Trigger fish is closed as of February 7, 2015 This is because state water landings in Florida and other gulf states caught the entire quota already. The season will also be closed in the state waters. Grouper is a full day trip if you want to even have a chance to catch them. They are usually caught in deep water from 175′ to 350′. Gag Grouper opens on July 1 and will be open the rest of the year and there is a bag limit of 2 per person with a 22″ total length. Red grouper is a 2 fish bag limit, 20″ total length and is closed February 1 to March 31. Scamp grouper is 4 fish bag limit, 16″ total length and is closed February 1 to March 31. 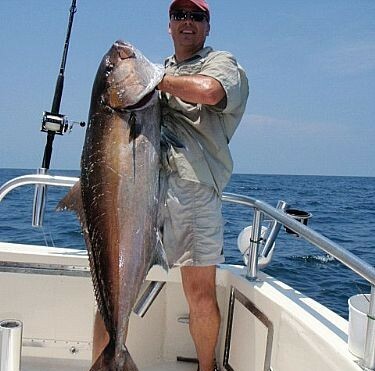 Greater amberjack is a 1 fish bag limit, 30″ total length and will close on June 1 and will reopen on August 1. Depending on the total number of fish landed during the first part of the year, the August season may be cut short. We will know how long in August about the end of July. Cobia is a 2 fish bag limit, 33″ fork length. This fish is open year round, but they are usually found migrating right off the beach beginning late March and continuing through the first week in May. After that time, the ones that are still around, settle in on over our artificial reefs in the Alabama reef zone. King mackerel is a 2 fish bag limit, 24″ fork length. This fish is open year round, but they are migratory. This means they start showing up off Alabama when our water temperature is about 70°. This is usually about the second week in June, most years. They do stay around our area until late October each year. These fish are very good to eat and are the species we catch the most of during the summer fishing season. This is one of the best eating fish there is in the entire ocean. Spanish mackerel is a 15 bag limit and 12″ fork length. This fish is open year round, but they are migratory like other species in the mackerel family. They usually show up in Alabama waters about May of each year and work their way through toward Louisiana waters. During the fall they are all grown up and we catch them moving back through our waters. Now we do catch them all summer, but the bulk of them move late spring and mid fall each year. Vermilion and red porgy are not in the snapper family at all. Some people even call red porgy a white snapper, but that is not what they are. These fish are what ever other charter boat fishes for when other seasons are closed. We are not like other boats and we don’t target these fish unless you “must” have something to take home. Our guests had rather catch a big fish they had to let go than to catch these. These fish are tasty, but they require a longer boat ride offshore and they are about 10″ to 12″ in length. They are caught using two hooks a time and you need all 6 people in your group fishing hard in order to make them bite well. After a 6 hour trip, at best, you will have a pickle bucket full or about a gallon zip loc bag full of filets. If you are set on something to eat and don’t mind the ride, we will take you to catch them.